Dan & his pal Brendan (the London fireman) have been rearing rare breed English pigs for the last 2 years. This started with 5 piglets that were bought from the lovely Henry Oldham from his Sow Matilda. 4 little piggies went to market, but ‘Lucky’ as she is now affectionately known, has gone on to farrow her own litter. More piglets have since been bought and have been fattened up for the table. 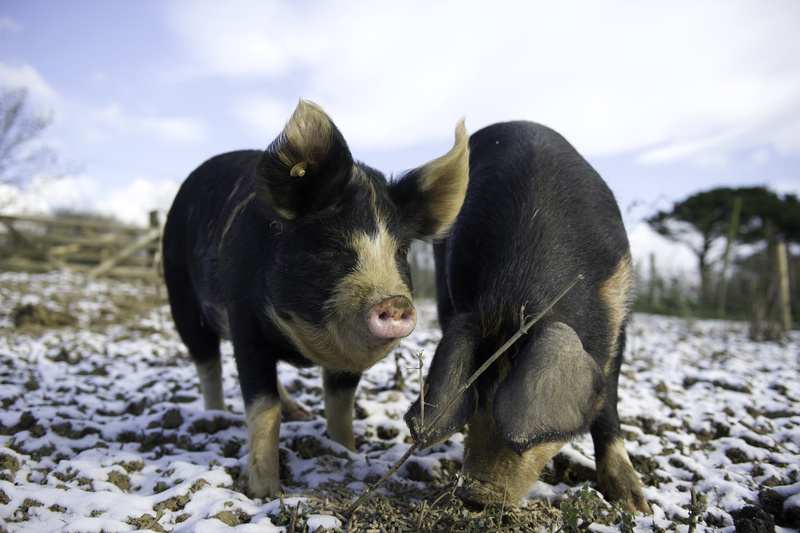 In October 2012 ‘Thatcher’ and ‘Osborne’ were purchased from a lovely farm near Oakhampton. Thatcher is a pedigree Oxford Sandy and Black and was bought to breed from. She has recently farrowed a litter of 8 in November. Osborne has already made her way to the specials board. So, at the moment on The Folly there is a heavily pregnant Lucky who is due in March, Thatcher and her piglets. There are also 20 hens providing free range eggs for our customers to buy and our kitchen to cook with.